Apex BASE is the largest manufacturer of BASE specific equipment in the world. 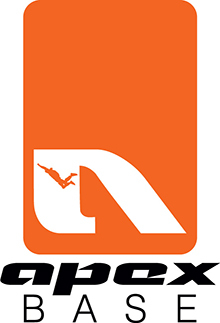 We are the only BASE Company that designs, manufactures, and distributes BASE jumping Harness / Containers and BASE specific Parachutes. We pride ourselves not only on the customer service we provide but also on our industry leading innovation and unparalleled manufacturing tolerances. BASE jumping is who we are, what we love to do, and where our focus is. Apex BASE manufactures parachute containers that go by the trade names of Apex DP, Summit, and TL container systems. We also manufacture the FOX and FLiK parachute. We manufacture many accessories including toggles, bridles, pilot chutes, sliders and risers. We have several sewing machines available to construct a wide variety of products including single needles, double needles, bar-tacks, zig-zag, and class 7 harness machines. We use a CAD-CAM machine for precision cutting.